This weekend there is finally some good news from Mercer Raceway Park, for the first time this season the track will open its gates so racing can return to the 3/8th mile dirt oval. This Friday, July 13, and Saturday, July 14, the roar of engines will return to the track for the Mercer Summer Nationals. For the first and only time this season fans will be able to return to Mercer for some dirt track racing. Six divisions will compete over the two-day event along with a spectacular fireworks display to close out the action on Saturday night. Action gets underway Friday evening when the grandstand gates open at 4 p.m. with the first green flag scheduled for 7 p.m. Open stock cars, 270 micro sprints, and mini stocks will make up the card for Friday’s return to action. There will be an open practice once the races are completed Friday along with post-race entertainment. Camping for the event is free and encouraged for the entire weekend. Racing will resume on Saturday with the return of the 410 sprint cars as they do battle for a $3,500 winner’s check. All of the area’s top teams are expected to be in attendance along with several invaders from Ohio’s FAST Series along with other Ohio invaders making for a strong field of winged racers. The mod lites will also be on the card as they honor late racer Mark Marcucci who tragically lost his life in a highway car accident earlier this year. The event will pay $888 to win in a tribute to the all=time mod lite win leader at the track. The open stock cars will return for Saturday’s event as they compete in a $1,200 to win event. Rounding out the card will be the first-ever visit by the Super 6 late models joining the event as an exhibition class. With a large list of contingency awards and cash bonuses that are still growing high-car counts are expected both days in all classes. This should be an action-packed two days and one racing fans in the area will not want to miss. This past Saturday Sharon Speedway honored one of the area’s best drivers to ever strap into a race car with the 10th annual Lou Blaney Memorial. It seemed fitting that his oldest son, Dave Blaney, won the event and become the first repeat winner of the race. Although Blaney won, local racer George Hobaugh of Karns City almost stole the show as he caught Blaney and passed him late in the race to lead a lap before Blaney would get back by him. 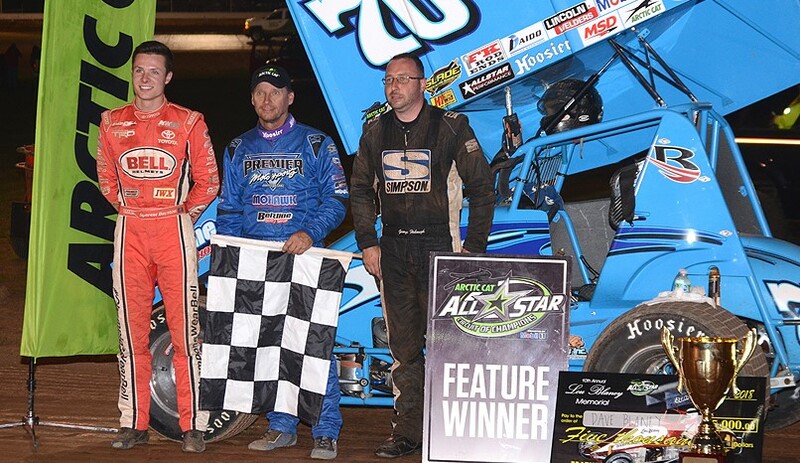 For Hobaugh, it was his biggest career payday and career-best All-Star finish as he held on for a strong second-place finish. Winner Dave Blaney is joined by 2nd place George Hobaugh and 3rd place Spencer Bayston. Photo by Rick Rarer. In the modified portion of the program, it was New York native Mike Maresca drawing the pole and leading all 35 laps to score his first Lou Blaney Memorial victory. Maresca also became the ninth different winner in 10 events. Franklin driver Kevin Hoffman put together a good run finishing second while Ohio racer and longtime Sharon Speedway regular Jim Weller rounded out the podium. Sharon Speedway will not be racing this weekend as they are idle for the Trumbull County Fair. Hummingbird Speedway completed its mid-season championship races this past Saturday which found three repeat winners and two new faces in victory lane. Josh Fields scored his third win of the season in the stock car feature while Doug Surra also made it three wins in the semi-late feature. Rich Howell completed the hat trick with this third street stock win of the season. Derek Rodkey scored his first late model win of 2018 while John Campisano did the same in the four-cylinder main. The biggest sprint car race in northwest Pennsylvania is just around the corner as the World of Outlaws invade Lernerville Speedway Tuesday, July 17, for the 27th annual Don Martin Memorial/Silver Cup. David Gravel edged Outlaws champion Donny Schatz to win last year’s event. The event is back to a single feature format paying $25,000 to win the 40-lap affair. Sprint car qualifying is slated for 7:15 p.m. with opening ceremonies to follow at 8 p.m. 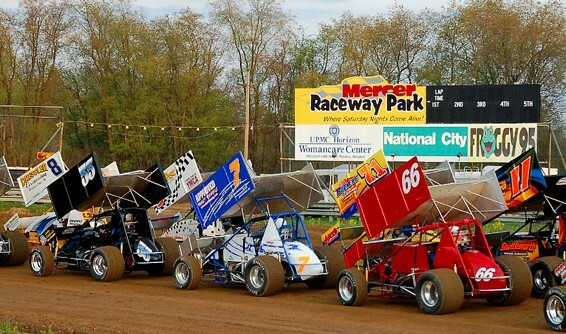 Racing returns to Tri-City Raceway Park this Sunday with the second appearance of the 410 sprint cars for the track’s “Summer Sizzler” event. Also on the card, Sunday will be the RUSH wingless sprint cars and modifieds. Rounding out the program will be the open stock cars. The new clay surface was smooth and produced some great racing during last month’s race which should bring out even more cars for this event and make for a great show. Grandstand gates open at 4 p.m. with racing scheduled at 6 p.m.